GRAND RAPIDS, Mich. — December 3, 2018 — Showcase craftsmanship and your interior design skills with the enduring appeal of nickel gap shiplap. 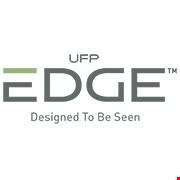 UFP-Edge™, a brand of Universal Forest Products, Inc. (Nasdaq: UFPI), proudly introduces Timeless nickel gap shiplap. Classic, versatile and easy to install, Timeless shiplap embodies the lasting appeal of shiplap and provides the perfect design element for rustic-chic and modern farmhouse styles. Timeless shiplap is made from finger-jointed, knot-free radiata pine, which resists warping. It’s available 1x4, 1x6 and 1x8 ready-to-finish primed white boards or prefinished multipack kits in farmhouse white, cavalry blue, or midnight black PPG-brand paint. Nickel gap shiplap is perfect for new construction and home remodeling projects for a variety of interior applications such as walls, wainscoting and ceilings. The clean lines and simple design of nickel gap shiplap allow for easy installation on virtually any interior wall or ceiling. Matching 1x4 trim is also available and offers a perfect complement to Timeless shiplap. UFP-Edge Timeless nickel gap shiplap is available nationwide — online and at select retailers. For more information, including where to buy, visit www.ufpEDGE.com/timeless. With primed and ready-to-finish or prefinished, UFP-Edge is simply the most comprehensive line of siding, pattern and trim on the market. UFP-Edge products are manufactured near customer locations, so they don’t sit in yards or distribution centers where they can be exposed to the elements and to the wear and tear of frequent transport. Headquartered in Grand Rapids, Mich., with facilities throughout North America, Australia, Europe and Asia, Universal Forest Products, Inc. (Nasdaq: UFPI) is a holding company whose affiliates serve the retail, construction and industrial markets. Those affiliates are strategically positioned to deliver a wide variety of products to nationwide retailers that cater to both consumers and contractors.